As he carries on the traditions of the Polynesians as what the warriors may have looked like throughout the ages. This muscular Hawaiian paddler, with roots that go back to Rarotonga in the Cook Islands, has been hammer ing away at his craft for the past twenty eight years! Newly into his forties, Tapaari‘i or “Tapa” as most of his friends call him, remembers first paddling for the Lokahi Canoe Club as a young paddler. He then went on to the Healani, Out rigger, and currently the Lanikai Canoe Club. Tapa grew up in Kapalama Heights, and graduated from Maryknoll High School in Honolulu. 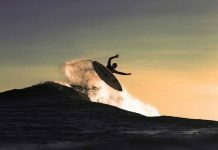 His talents in the water include, Stand Up Paddle (paddling/surfing) Surfing, four man canoe surfing, swimming, and bodysurfing. Over the years, Worthington trained and became an elite paddler. He has continually grown and honed his skills and expertise, to become one of the best paddlers around. He has made an annual event of crossing the Kaiwi Channel. 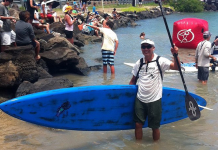 On his own, he has competed in the Kaiwi Channel Solo OC-1 World Championship on twelve occasions, the Pa’a Molokai Relay fifteen times, and with his clubs, in the Molokai Hoe, twenty times! 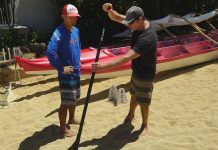 Wothington remarked, “My best finish in the ‘solo’ was fifth place.” Recently, Worthington and his longtime friend, Kealii Paiaina, won the Masters Division of the PAA Kaiwi Channel Relay. Tapa added, “I highly recommend racing in the Vaka Eiva, if you have a chance to travel there.” He described another landmark experience. “I had the privilege of practicing with team New Zealand/Hawaii, and racing in the Henry Ayau Long Distance Race with them. They then won the Moloka’i Hoe race a month later. Paddling with team New Zealand/Hawaii, I learned a lot, especially about the high level of dedication and commitment that it takes to be in one of the elite crews. To me, it was one of the experiences I will never forget.” Worthington, a flight attendant for Hawaiian Airlines for the past seventeen years, has had many opportunities to paddle in faraway places. Tapa has paddled in Australia, New Zealand, Tahiti, California, Rarotonga, and all of the neighbor Islands. When he’s not in a canoe, you can find him at one of his favorite beaches in Pupukea, on the North Shore of Oahu. “There is lots of good surf, and there is a different vibe out there. It is more relaxing to head to the country and spend time with family and friends.” Makai queried Tapa on who inspires him in paddling. Tapa is a multi faceted paddler. Besides travelling the globe, he has a bit of acting in his blood, as well! A few years ago, he portrayed the infamous Eddie Aikau in ESPN’s 30 for 30 documentaries. Additionally, Worthington has also had some “Hawaii Five-O” acting experience!